Summary : This tea smells like oranges, looks like oranges, but really doesn't taste like oranges. Still, it is a good and tasty tea. Review : Is there anything better than oranges? Healthy, sweet, beautiful to look at. Oranges are, quite simply, one of the greatest natural inventions ever. And with that thought in mind, it should come as no surprise that if something says "orange" on it, I'll try it. Period. And especially in a tea, since you can have your oranges without any calories or tooth decaying worries. And so it was with that mindset that I approached my first cup of Culinary TeasFlorida Orange Rooibos Tea. I must confess, I had REAL high hopes for this tea, as I absolutely adore Adagio's Rooibos Orange Tea, and this tea has both a similar name and a similar look to it. Initially, I could find nothing I might dislike about this tea. The leaves look beautiful, and they had a moderately strong but pleasing fragrance about them. And during the brewing, well, talk about your beautiful teas. During the brewing process you can watch your tea as it transforms into this beautiful, relatively dark orange/red color. Yet, sadly, the taste was somewhat of a disappointment. Despite the orange look, despite the orange title, despite the orange leaves, the tea itself really didn't taste anything like an "orange tea." Or, I should say, it didn't taste what I feel a orange tea should taste like. And I'm not sure why this is. 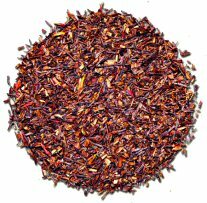 This tea contains the following ingredients : Rooibos, Thistle Petals, Natural flavors. One would assume that the "natural flavors" were what was suppose to deliver the "orange taste" to the tea. To put it bluntly, the taste was a bit uninspiring. Now, this doesn't mean the taste was bad. Far from it. The tea indeed did have a moderate strength taste to it, and it was relatively pleasing to the tongue. The problem was, of course, is that it wasn't a orange taste. And since I wanted a "orange taste" and didn't get it, I was naturally thrown into the depths of despair. All said and done, this tea isn't bad, but it's a stretch to say it's a "orange tea." If you really want a orange tea, try either Adagios Rooibos Orange Tea or, for a super sweet, super strong Orange tea, try Tazo's Wild Sweet Orange Herbal Tea. Recommendation : Maybe. It's not a bad tea, it's just not a "orange tea." The tea does have a pleasant flavor and a beautiful color, but I definitely would not say it's a tea for people like me who can't get enough "oranges" in their life.